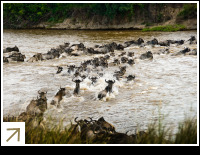 Seeing the Great Migration is one of the things on most people’s bucket list. We’ve all seen it on television but nothing can match up to the experience of being there as around a million and a half animals pound the earth into dust with their hooves on an epic quest for food. From Tanzania's Serengeti to the hills of Kenya’s Masai Mara, over 1.4 million wildebeest and 200,000 zebras and gazelles, all being relentlessly pursued by Africa’s great predators, make the perilous journey of 1,800 miles each year in search of fresh green shoots to graze upon. The key places of departure and arrival for the migration are Tanzania’s Serengeti and Kenya’s Masai Mara. It is, of course, impossible to call somewhere the starting place as the migration is a timeless circular trek across the face of Africa following the pattern of the rains. Wildebeests (gnus), which make up the overwhelming majority of the animals, give birth to their offspring between December and March. This takes place on th short grass plains of southern Serengeti, and is, of course, of great interest to the thousands of predators who prey upon the weak youngsters. The migration arrives in the Masai Mara in Kenya in mid-July and makes these plains their home for 3 to 4 months depending on the rains. During this time, the plains are black with the sea of wildebeest, and the Masai Mara is the best place to witness the famed river-crossings where thousands of animals risk their lives to cross the river, having to contend with strong currents and crocodiles lying in wait. Spend 4 relaxing days on Kenya's top beach and 2 days enjoying the animals and stunning setting on a true Kenyan safari. To make the Safari even more special we are including a FREE night game drive. A unique opportunity to see the Great Migration in the Masai Mara this August with space we are HOLDING so therefore can CONFIRM during this peak season in Kenya. Dont miss out! Pure luxury is in store for you on this four night flying safari! Short on cash? Then Camping is the perfect way to witness the Great Migration this July / August for much less than you would pay to stay at a hotel or lodge. From the soft leather seats of the aircraft you will look out over the vast plains of Africa while the pilot provides commentary on the landmarks and wildlife. Soft leather reclining seats with the ability to move in all directions to ensure a lot of leg space – this allows you to travel in style. A perfect mini break that won’t ‘break’ the bank. Two of Kenya’s finest destinations. A ‘Great Lake’ and a ‘wildlife marvel’ you couldn’t ask for more on a three night adventure through Kenya. Stylish, unique and exclusive. Our Kenya in Style safari is for those that appreciate the finer things in life. Short, sweet and luxurious this Masai Mara Safari is the perfect addition to a Kenyan beach holiday or a great quick trip to see the wonders of the Masai Mara. Stunning views of Kilimanjaro, the most famous of the Rift Valley lakes and the jewel in the crown - the majestic Masai Mara. An amazing opportunity to tour Kenya with a group of safari enthusiasts. See two of Kenya’s gems in style and comfort and get a taste for the country's extraordinary beauty - from the flamingo lakes in the Rift Valley to one of Africa’s showpiece parks, the Masai Mara.